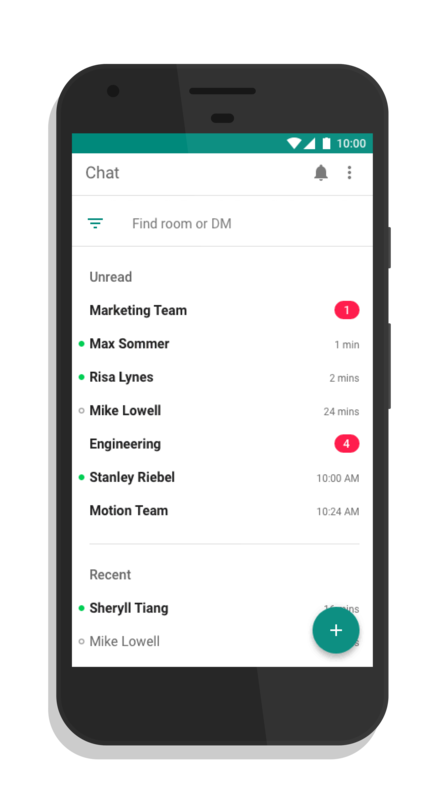 Nearly a year after it was announced and almost all of that time in early adopter programs, Google’s Hangouts Chat is now generally available as a core service to G Suite customers. It provides deep integration with the entire G Suite of apps for easy collaboration and sharing of files along with group and direct messaging capabilities. There are also some 25 bots available starting today to further integrate with other solutions your organization may have in their portfolio. The most direct comparison of Hangouts Chat in the market today is Slack and in many ways, the two messaging & collaboration solutions are equal. But for G Suite customers, the advantage of Chat is that everything stays inter-domain which provides another layer of security. Easily work with other G Suite apps. Upload items from Drive, collaborate on Docs, Sheets or Slides, join online meetings with Hangouts Meet, or use Google’s powerful search to look up room members, past conversations and shared files. Use artificial intelligence to speed up workflows.When your teams collaborate in Chat, you can speed up manual work, like booking conference rooms, searching for files and more using artificial intelligence. Collaborate with colleagues around the globe.Chat currently supports 28 languages and each room can support up to 8,000 members. It’s available on desktop for Windows and MacOS, as well as iOS and Android so you can easily collaborate on the go. Have peace of mind with embedded security. Chat builds on G Suite’s security-first ecosystem and offers an enterprise-grade solution that’s reliable and compliant. With integrated support for Vault, admins can archive, preserve, search and export Chat-specific data. Finally, to clear up some confusion on Google’s messaging & video strategy, here is the plan as it has been explained to me. Hangouts “Classic” – The non-G Suite version but it is unclear what the future holds for it. If you have Hangouts “classic” as a G Suite customer, you can still use it in conjunction with the new Hangouts Chat. That is, all your contacts will sync over. Hangouts Chat will be rolling out to G Suite customers over the course of the next seven days.